There was no shortage of locations that fitted the bill in the band’s home town of Los Angeles, but Henley looked further afield for his creatives, turning to British art director Kosh, who made his reputation with The Beatles (most notably 1969’s Abbey Road) and consolidated it with work for The Who (1971’s Who’s Next). Having moved to the US West Coast a few months earlier, Kosh was brought in by Eagles’ management to meet the band and hear a rough cut of the title track from their next album – a hummable but hollow-eyed tale of LA burnouts populating a hotel from which you ‘can check out at any time you like, but you can never leave’. Then, with the vibe established, it was down to business. 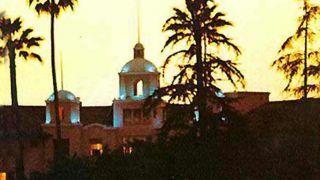 In a 2007 interview with The Rock And Roll Report, Kosh recalled that “Don wanted me to find and portray the Hotel California – and portray it with a slightly sinister edge”. Eagles: The Heroes Or Villains Of 70s Rock? Setting out with photographer David Alexander, the designer shot a shortlist of three locations. Henley chose a dusk shot of the Beverley Hills Hotel at 9641 Sunset Boulevard. Choosing the shot of the Beverly Hills Hotel was the easy part. To shoot it had been more of a challenge, requiring Kosh and Alexander to sit for hours in a ‘cherry-picker’ platform suspended 60 feet above the street, firing off their cameras, trying to capture the exact moment when the sun dipped behind the building. Bright and breezy in reality, the Beverly Hills looked seedy and dissolute in the resulting cover shot.